The only breed to originate from Canada, the Tonkinese was developed in the early 1960's by crossing a Seal-point Siamese and a Sable Burmese. The Tonkinese is an inquisitive, active, loving and responsive cat. The mating of two Tonkinese will produce an average litter of four kittens, and usually producing two Tonkinese, one Burmese and one Siamese offspring. The coat displays elements of both ancestral parents, with a rich Burmese body colour and Siamese points. 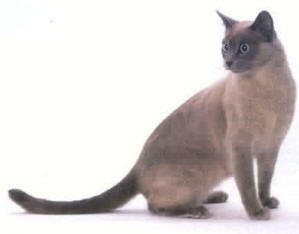 Tonkinese colours are called "Mink" and natural Mink remains the most popular (also called Sable or Seal). Other colours are Honey, Champagne (also called Chocolate), Platinum (also called Lilac or Frost) and Blue. Three coat patterns - Solid or Sepia, Pointed and the famous Mink - but all "Tonk" coats have that silken mink feel. The Tonkinese coat requires little work to maintain its luxurious texture - a few sweeps with a rubber cat brush and an occasional bath are all that is required. The colourful personality of the Tonkinese make them ideal companions. They will take possession of your lap and shoulder, and they will supervise your activities. They are warm and loving, highly intelligent, with an incredible memory and senses that are akin to radar. They are strong willed, and their humans are wise to use persistent persuasion in training them. They are naturals at inventing and playing games, using favourite toys to play fetch, and delighting in games of tag with each other. Of course hide-and-seek is a favourite game, which they play with humans as well as other Tonks. They become your "door greeter" and will happily entertain your guests. They have been described by enthusiastic owners as part puppy (following their owner around the house), part monkey (their "acrobatics" are legend! ), and can sound like an elephant running through your house when they choose. In short: they quickly take over and run your house and your life! Their affectionate ways are impossible to ignore, and they quickly endure themselves to family and visitors. Be aware that Tonkinese are great jumpers and climbers, getting to those seemingly inaccessible high places with ease. These cats are firmly convinced that humans were put on earth to love them; these are the cats that know they belong. Tonkinese are a little more "rounder" looking than a Siamese. Natural Mink Tonks all have aqua coloured eyes (not blue like Siamese) - they are the only cat with that colour eye. Pointed Tonks have bright blue eyes (sky blue to violet) and Solid Tonkinese have chartreuse eyes (green-gold to yellow-green). Their colour deepens (both coat and eyes) and finally matures at about 18 months to 2 years old.